During the months of November and December, Bosch has significantly expanded its range of aftermarket parts for models from many brands including BMW, Acura, Audi, Fiat and John Deere. The new SKUs cover over 4.8 million vehicles in operation in the U.S. and Canada which need replacement brake pads, starters and alternators. In the case of individual product lines, 34 new SKUs were added to the Bosch QuietCast Brake Pad, Bosch Blue Brake Pad and Bosch Severe Duty Disc Brake Pad product ranges in November and December. Due to this expansion, there are new part numbers which can be used for newer models of Asian, US and European vehicles. They include the 2016-‘17 Mini Cooper Clubman, 2014-‘18 Acura RLX, 2017 Kia Cadenza, 2014-‘18 Fiat 500L and 1992-2001 AM General Hummer. Thirteen new SKUs have been added to the QuietCast line and this extends coverage to over 1.2 million vehicles in the United States and Canada. The new part numbers include synthetic lubricant with all applications and a hardware kit on a few select applications. 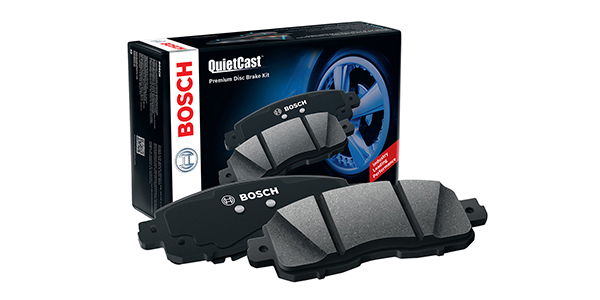 The Bosch QuietCast Brake Pads have been designed specifically for use by technicians who work on all makes and models. When it comes to the Bosch Blue Disc Brake Pad product range, 20 new SKUs have been added, and this covers 345,000 vehicles in the United States and Canada. The pads come with OE-style multi-layer shims for better noise dampening. The pads are meant to deliver high levels of quality and performance and will help shop owners meet the needs of customers seeking the best value. One new SKU has been added to the Bosch Severe Duty Brake Pad product line, and this expands coverage to over 4,000 late-model domestic vehicles in the United States and Canada. Bosch Severe Duty Disc Brake Pads come with an advanced semi-metallic and ceramic copper-free friction formula and multi-layer shims for superior noise dampening. Together, over 1.6 million additional vehicles are covered by the Bosch Blue, QuietCast and Severe Duty brake pad product lines. Fifteen new part numbers have been added to the Bosch Rotating Machines product range. This includes six SKUs for remanufactured alternators, one SKU for new alternators and eight SKUs for new starters. With the addition of the new SKUs, coverage has increased to over 3.2 million late-model domestic, European and Asian vehicles as well as John Deere applications which are in use in the United States and Canada. These vehicles include the 2008-‘11 Mercedes-Benz C300 3.0L V6, 2004-‘14 John Deere Loader 244J, JD 2.4L 59HP Diesel, 2014-‘15 Audi A6; A7 Quattro Q5 and more. The new parts are meant mainly for vehicles which may no longer be covered by warranty but are likely to need service in the independent aftermarket.